At the end of April, Ricoh launched the MP 2554SP. A direct replacement for the now discontinued MP 2553SP. 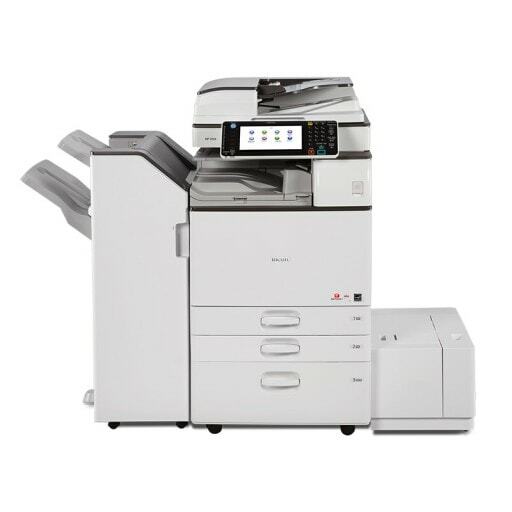 The 2554SP is a brand new black and white A3 business multifunction for medium to large companies. "The multifunctional MP 2554SP/3054SP/3554SP will significantly increase productivity in modern, fast-paced offices," says Karen Lawrence, Ricoh's product marketing manager. "They can be used as information portals and connected directly to cloud services via the Control Panel. They enable monitoring of user activity, energy consumption and operating costs. " One of the most interesting features of this model is probably the latest Ricoh 10.1-inch Smart Control Panel. It is a very familiar interface for anyone who uses an iPad tablet in everyday life (who is not?). Frequently used tasks can be accessed with a single click. The icons on the home screen can be reordered in a simple wipe operation. Who says getting ahead of the competition is difficult? It's easy when you can give your customers the information they need - in multiple formats and in multiple ways - quickly, with a host of standard security features. Perform daily office tasks including advanced printing, scanning, copying and faxing from the versatile MP 2554. Are projects piling up? Save time with pre-defined shortcuts to frequently use document tasks. You use your smartphone every day. Why not use it to print documents from where you are? You can even monitor user activity and power consumption remotely, and make strategic changes to simplify work and reduce costs. Original colour documents can be scanned at up to 80 originals per minute and stored on the 320 GB hard disk of the MP 2554SP or forwarded to e-mail, folder, USB or SD card. Outbound quality with up to 1200 dpi and a wide range of finishing options ensure the production of professional documents.